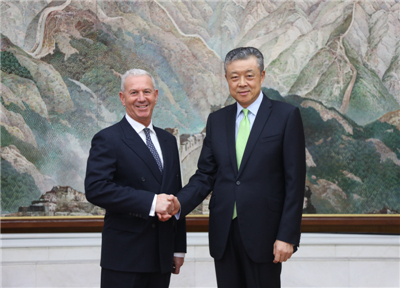 On January 17, Ambassador Liu Xiaoming met at the Chinese Embassy with Anthony Samuels, Chairman of Surrey County Council. Ambassador Liu noted that China-UK relations are currently enjoying a sound momentum of development with increasing pragmatic cooperation in various fields. Numerous highlights of local exchanges and cooperation have become a booster for the development of the relations between the two countries. 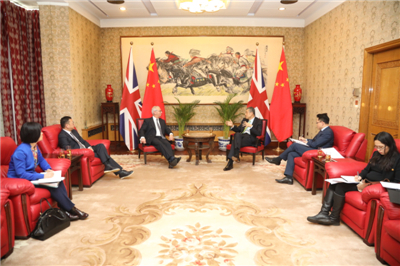 Last year, the fourth China-UK Regional Leaders’ Summit was held successfully in Dalian, Liaoning, with fruitful results. He hoped that the Surrey County Council would actively participate in China-UK Regional Leaders’ Summit and other mechanisms expand cooperation with China in trade and investment, infrastructure, high-end manufacturing and scientific research and innovation so as to contribute to the development of overall China-UK relations. Samuels said that Surrey is one of the largest counties in the UK economically, with per capita GDP ranking number one. Because of its outstanding geographical advantage and strong scientific and technological strength, Surrey has attracted many well-known international companies to settle in its turf. China’s achievements, which have enabled itself to provide huge market and cooperation opportunities for other countries, are admirable. Surrey welcomes Chinese investments. Attaching great importance to collaboration with China, Surrey would like to further expand exchanges and cooperation with China by establishing and developing friendly and cooperative relations with relevant provinces and cities in China.